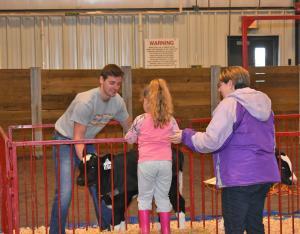 The 5th annual Animal Learning Day took place this past weekend at the Jeff and Deb Hansen Center in Ames, IA on April 7th from 9 AM - 1 PM for a day full of learning about animal agriculture! Close to 1700 people attended this free event with activities, photo booth, taste of Iowa section, education, live animal displays and a free lunch! This year, the Iowa State Block & Bridle Club handed out a passport book to each attendee with facts about animal agriculture and how Iowa agriculture feeds not only Iowa, but the whole world. Participants traveled the atrium and arena to get a personalized stamp in their passport books. The purpose is to give attendees a better understanding of agricultural practices and build awareness about agricultural industries and commodities. Experts will be available to answer questions about agricultural practices. Block and Bridle is one of the largest clubs on the ISU campus with over 500 club members. 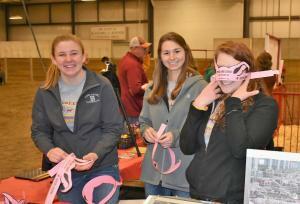 They focus on the animal industry and pride themselves in advocating for the agricultural industry through various shows, activities and other events. Hansen Storage Event Coming Up!